The air is filled with snow flurries and laced with love; this Valentine’s Day treat the one(s) you love to this decadent Chocolate Fudge Cake, cloaked in a luxurious chocolate ganache and finished off with new M&M’s® Strawberry candies! I found myself thinking about that the other day, after a friend of mine remarked that “All the world’s a stage,” and I couldn’t help connecting the two. In other words, the world is like a garden, a stage of sorts filled with all of the ingredients necessary for a grand tale. As actors on that stage, we move from day to day following our script, speaking our lines, and going through our motions. While there’s nothing ‘wrong’ with this, there is no audience. Instead, the curtain is drawn shut, and the stage lights are dark – and so we speak our lines into the dimmed silence of the empty theater. However, when the audience does arrive, whether drawn by curiosity or by the spectacle, the lights flicker on, and the curtain is cast open. Instantly there is meaning behind the performance, the applause of the crowd, the heat of the lights, and at once the actors are driven by the promise of purpose. It might be considered odd then that only a single holiday is devoted singularly to love. Yet, in so many ways the other holidays are in fact expressions of love, such as Christmas and its focus on familial cheer, or New Year’s and its focus on renewal and good will, yet in no instance is the celebration of love central. It is for precisely that reason that I always like to give Valentine’s Day’s a little extra attention. However, just as the love at Christmas isn’t strictly romantic in nature, the same is true for Valentine’s. And before you roll your eyes, I mean that quite sincerely, not in the clichéd sense of “this is Lonely Heart friendly.” For example, I picked up American Greetings® Valentine’s Day cards along with a DOVE® Valentine’s Day tin at Walmart just yesterday, which are both perfect for close friends, coworkers, or family members. That said, I didn’t want to end Valentine’s Day there, instead I wanted something to which I could add a bit of a personal touch, and that’s how today’s recipe for our M&M’s® Heart Cake came to be, which I prepared with an 8oz bag of M&M’s® Strawberry to add an extra layer of seasonal flavor and color. 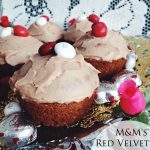 I also used additional M&M’s® Strawberry as decorations, as shown below, to add a dash of contrasting color against the chocolate fudge frosting. Again, like the cards and the tin, the cake is perfect whether you’re celebrating with close friends or family, or it can serve equally well as a Sweetheart Cake. 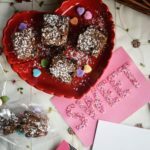 Either way, it’s an absolutely quintessential Valentine’s Day treat, combining all of the sweet flavors and colors one has come to associate with the day. In a large bowl, sift together flour, cornstarch, baking soda and salt. Whisk and set aside. 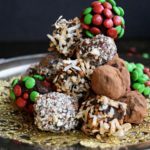 In a double broiler, melt down semi-sweet chocolate and hot water until the chocolates have melted down completely and smooth sauce comes together. Add 1/2 cup sugar and stir just until the sugar has dissolved. Remove from heat and set aside. In the bowl of your mix master, beat together butter until whipped. Add eggs one at a time until combined. Add remaining 1/2 cup sugar and vanilla. At low speed, add flour mixture alternately with milk. Beat after each addition until a smooth batter forms. Add the chocolate mixture to the cake batter and beat at low speed until well blended. Set mixture aside. Preheat oven to 350 degrees F. and prepare cakes pans. Butter (1) 9-inch square cake plate and (1) 9-inch circular cake pan. Fit each pan with parchment paper and butter the parchment paper, then dust each with cocoa powder. Divide the cake batter between both cake pans. Sprinkle M&M's® Strawberry into each cake pan. Place in the oven and bake for 25-30 minutes or until cake tester comes out clean. Transfer both cakes onto a wire rack and let cool completely. Once the cakes have cooled, remove each from their pans. Divide the circular cake in half. Place the square cake down onto a piece of parchment in a diamond shape. Spread frosting along the edges of the diamond and place the halved circles on each side to form a heart. Spoon the rest of the frosting over the cake to smooth out any uneven edges and gaps between the cakes. In a double broiler, prepare your ganache. Melt down chocolate with cream and syrup until smooth. Remove immediately from heat and drizzle of the cake, spread the ganache evenly over the cake with a knife. Decorate your cake immediately before the ganache sets. Outline the cake with M&M's® Strawberry and pearl sprinkles. If you so desire, you can also create a chocolate stencil for the center simply by melting down 1/4 cup white chocolate melting candies. 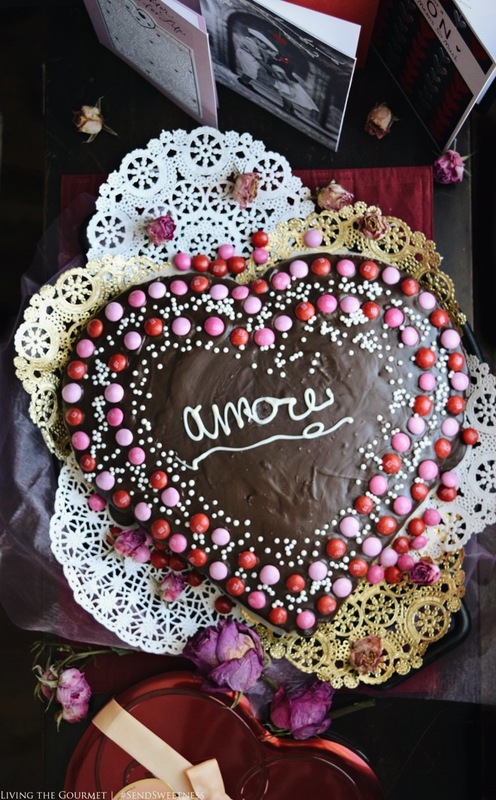 Transfer the melted chocolate to a piping bag and write out any sweet Valentine’s message on to your cake. Let the cake set before serving and enjoy! With the cake prepared, the cards bought and signed, and the tin ready to be gifted, all that remained was to prepare the tablescape, and sit down to celebrate Valentine’s Day with my family. What are some of your favorite ways to celebrate Valentine’s Day? We would love to hear from you. Also, don’t forget print this coupon to save $1.00 on ANY TWO (2) M&M’s(R) Brand Chocolate Candies, 8oz or larger. This is seriously so pretty!! That is one gorgeous cake! Perfect for Valentine's Day! This is so cute! 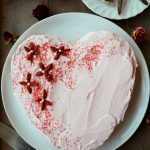 I love how you used the square cake and the cut in half round cake to make the heart shape! Brilliant! This is so rich, beautiful and irresistible! Chocolate fudge, be still my own heart! 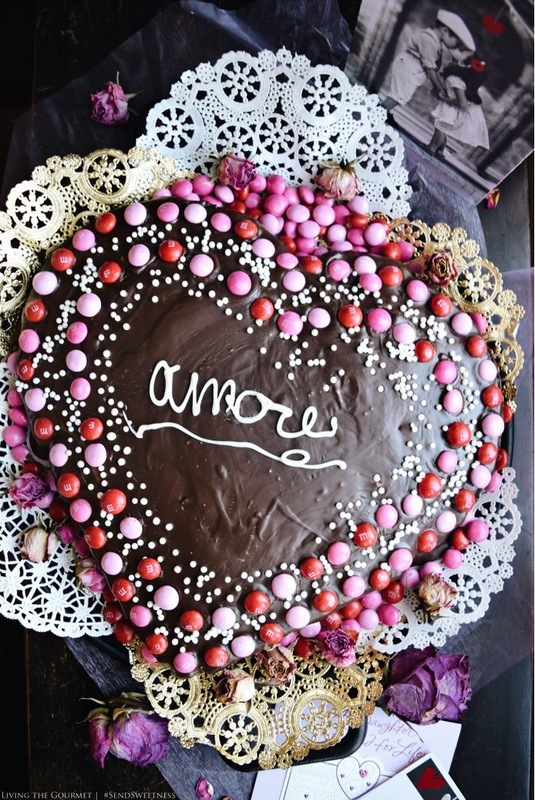 This cake is gorgeous and hits the spot for chocolate lovers! 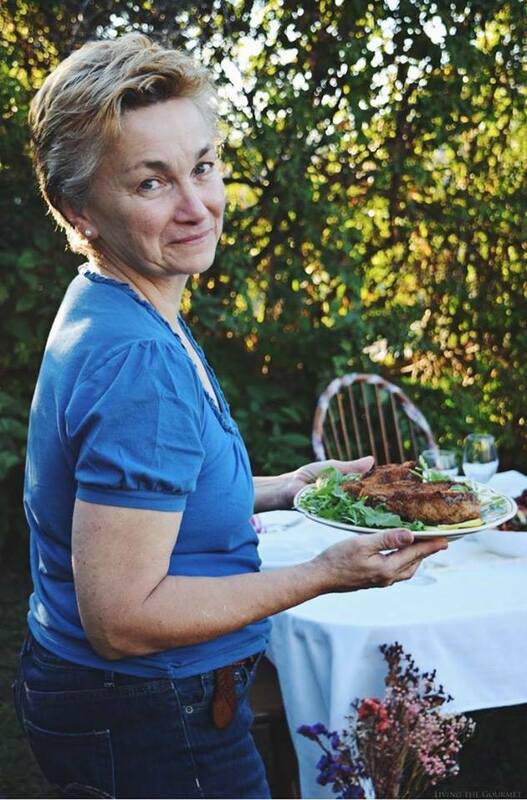 What a festive and pretty cake, Catherine! I love chocolate and strawberry together, and this cake is calling my name! 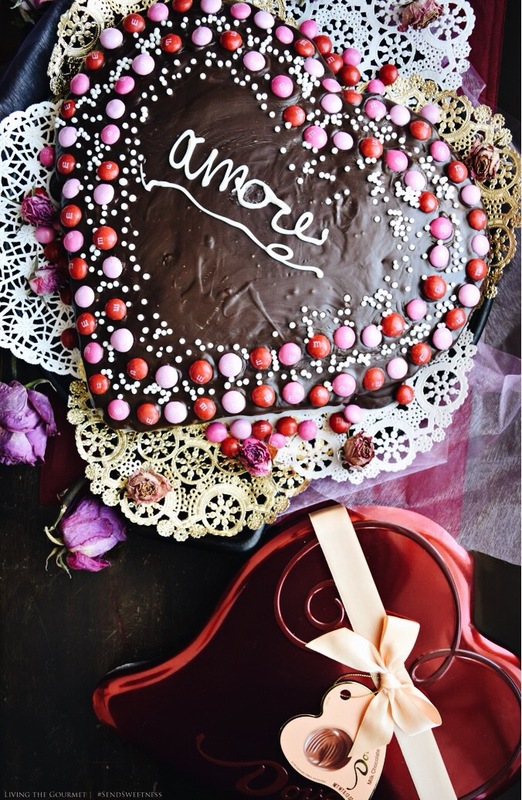 What a perfect cake for Valentine's Day! 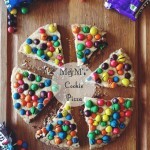 Love the garnish of M&M's and pearl sprinkles---beautiful!! !